“Autobiography”, the Tang dynasty masterpiece of “wild” cursive script by the monk-calligrapher Huaisu, consists of 702 characters arranged in 126 lines. 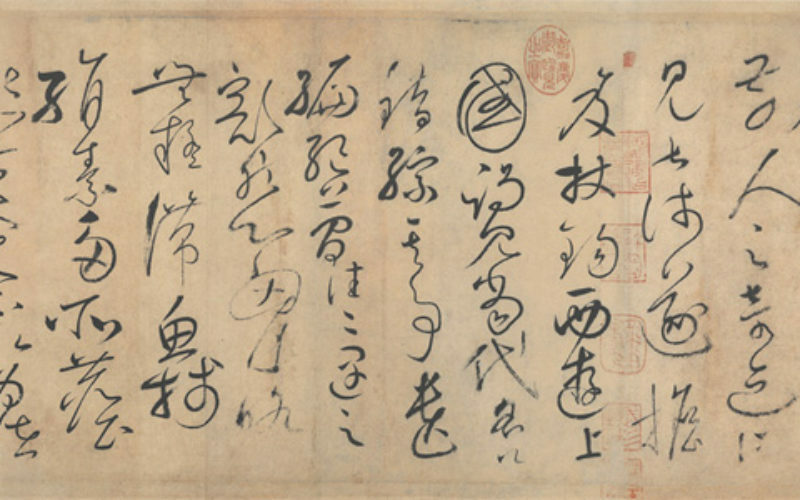 In terms of the dimensions, number of characters, and size of the script, this piece stands out as unique among all the examples of cursive script from the Tang dynasty or before. Huaisu dated the scroll to the twelfth year of the Dali (大曆) era, which corresponds to 777 in the Western calendar, making this a classic from about the age of 40. In the Song dynasty (960–1279), three “Autobiography” handscrolls reportedly existed. This handscroll, now in the collection of the National Palace Museum, is apparently the only one to have survived. A record of connoisseurship indicates it was in the court of the Southern Tang (937–975) during the Five Dynasties Period, and by the early Song dynasty it appeared in the collection of the connoisseur Su Shunqin (蘇舜欽, 1008–1048). Passing through private hands from the Northern Song, Southern Song, Ming, and into the Qing period, it entered the Qing court collection during the reign of the Qianlong Emperor (r. 1736–1795), thus having a documented history of more than a thousand years.